Hometown of many Bai merchants, Xizhou boast some impressive architecture. Happy Times: Lin Biao with Chairman Mao in a temple mural in Xizhou. Xizhou is a well-preserved example of Bai town, with splendid private house. The town remains quaint, with narrow streets and a long shopping street stretching from the charming central square, where many souvenir sellers, often dealing in tie-dyed cloth from nearby Zhoucheng, have set up stall. During the Nanzhao reign Xizhou was a military fortress and an occasional residence for its rulers. Its residents made much money on the trade from Yunnan into Tibet and a large number of compounds built by the wealthy merchants remain today. The most affluent families were the Yan, Yang, Dong and Yin, all much prosecuted during the early years of communist rule. The Yan’s compound lies in the central part of Xizhou. It is made of five courtyards from north to south, with the imposing front gates illustrating the owner’s economic status. Doors and windows are engraved with figures birds and flowers, wash paintings cover the walls. 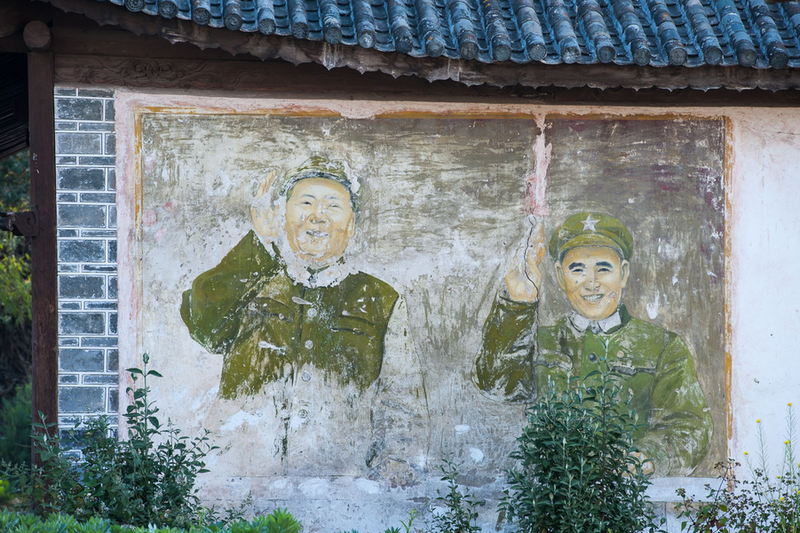 On the southern end, in 寺上 village, is a large abandoned temple complex, featuring an interesting Cultural Revolution wall painting of Chairman Mao with Lin Biao. The market in Xizhou is every morning. Some guesthouses in old buildings, including the expensive Linden Center, but overall few tourists stay in Xizhou.